Good evening invited guests… staff & students… family & friends… and the Chatelech CLASS OF 2018. I am Trustee Christine Younghusband and I am honoured to be here tonight to send YOU greetings from the School District 46 Board of Education. 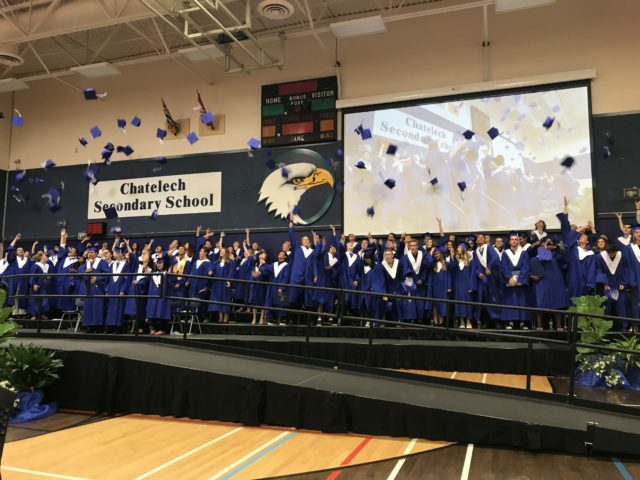 Tonight, we are celebrating YOU and your accomplishments in completing your K-12 education… but we are also “saying goodbye.” Goodbyes are not easy… particularly when you have close friends, a deep connection with a teacher or two, or wonderful memories here at Chatelech Secondary. First, I would like to acknowledge and thank Principal Mark Heidbrecht, Teacher Nina Bartels, and Education Assistant Peggy Hunt for their years of service in SD46. They are retiring at the end of this school year and “saying goodbye” to Chatelech… but HELLO to the next chapter in their lives. I am also “saying goodbye.” This will be my last graduation speech at Chatelech Secondary as a School Trustee. I will not be seeking re-election in October along with Trustees Dave Mewhort, Greg Russell, and Betty Baxter. It was a pleasure to work these people on the Board of Education… but it was also a pleasure to work with this year’s Student Trustee Pearl Deasey. Finally, YOU are “saying goodbye.” No more bell system. No more hot lunch. No more exams, papers, or projects. You are “saying goodbye” to your K-12 school routine… YOUR RITUALS. You might be saying goodbye to your friends, family, or the Sunshine Coast… to turn the page to the next chapter in YOUR LIFE. Some of you might go to school in the fall… some might travel… while others will go to work. Regardless of plans, the world and it’s possibilities are right in front of you… and we hope as the Board of Education that your experience at Chatelech Secondary helped you. The Sky is the Limit. On behalf of the SD46 Board of Education… CONGRATULATIONS… Good Luck… and HELLO!!! We are excited for you and we wish you all the best in your future endeavours.